L to R/top to bottom: Our first wilderness cabin and rustic kitchen in Jasper N.P. 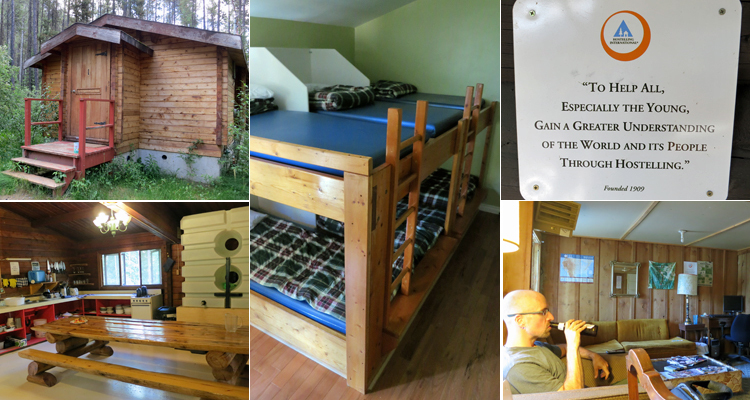 ; the offending 6-person bunk last night in Canmore; Hostelling International’s mission (They just need to add “up-close and personal”); and my mission tonight at Glacier N.P. (blogging and beer). These first two weeks on the road were intended, in part, to be a dry run for our longer journey this summer. A short trip provided us with a chance to figure out what worked, what didn’t, and what we would do differently (or the same) when we’re gone for a longer period of time. One of the things we’re experimenting with is our use of technology on the road–things like which blogging platforms, internet connections, laptops, phones, and cameras work best for us. Included in the camera category is video…whether shooting video of our travels is feasible, and more importantly, whether it is interesting–both to us and to you.